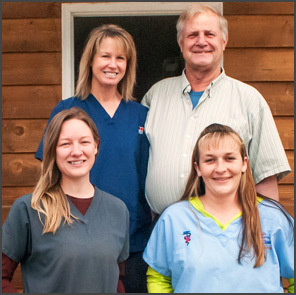 Valley Veterinary Clinic's goal is to provide excellence in small and large animal diagnostics and treatments. Our professional and courteous staff strive to deliver high quality customer service to our clients. At Valley Veterinary Clinic, the well-being of our patients always comes first. Valley Veterinary Clinic is committed to providing compassionate, competitively priced, top quality veterinary care. Our full-service animal care facility has been providing excellence in veterinary surgery and medicine since 1978. The comfort and well being of our patients is always our top priority. We regularly consult with local and national experts in cardiology, radiology, surgery, dentistry and medicine to be sure we are providing the best possible care. At Valley Veterinary Clinic Twisp, we treat your pets like the valued family members they are. Terri was raised in Santa Rosa, California. She attended The University of California at Davis School of Veterinary Medicine where she graduated in 1988. While in veterinary school she completed two fellowships: one at M.I.T. and one at The Hershey Medical Center in Pennsylvania. Upon graduation Terri did a residency at the University of Texas Southwestern Medical Center in Dallas, studying Comparative Medicine. Lacey was born and raised in Twisp, Washington. When she was young she developed an interest in horses and eventually worked for several outfitters during JR. high and high school. In 2009 she relocated to the Omak-Okanogan area and began working for the Animal Hospital of Omak as a veterinary assistant. In 2010, she traveled to Virginia and studied at Equissage to become a certified Equine Sports Massage Therapist. Sarah Henry was raised in both Royal City, and Mazama. Sarah and her family traveled back and forth seasonally due to the family’s cattle operation. Sarah grew up on horses and still continues to enjoy this part of her life. She graduated from Liberty Bell High School in 2006. Sarah spent several summers working for Early Winters Outfitters as a wrangler and helped teach people how to horseback ride. Debbie Nations was born and raised in Arlington WA. Her childhood was lived on a family dairy farm where she developed a special interest in dairy cows. Throughout her young adult life she worked at several different dairy operations and really enjoyed raising calves. In 1990 she moved to the Methow Valley with her husband and two sons. Debbie was the Janitorial supervisor at Sun Mountain Lodge for 23 years. During her time at Sun Mountain Lodge he developed many connection and local valley friends. Her interest in animal care and fun loving personality makes her a beautiful fit as the receptionist at Valley Vet. In her free time she enjoys snowmobiling, riding side by side with her husband and lots of family time. "As clients of the Valley Veterinary Clinic for 12 years, we have received excellent services. Whether it be an emergency surgery, stitches, spay/neuter or a horse with colic at 3 A.M. on a Saturday or Sunday, they are always willing to make a house call or clinic call. They are truly the OTHER FAMILY DOCTOR."